Hundreds of Peruvians, including outgoing President, Alan Garcia, turned out on Wednesday to welcome the world’s largest statue of Christ in Peru. The structure which measures 123 foot (37 metres) has caused controversy among Peruvians, but there was little evidence of that on Wednesday as the people of Peru celebrated its arrival with music and fireworks. The statue was officially inaugurated by President Garcia. Monsignor Bruno Musaro, the Apostolic Nuncio to Peru, was also in attendance at the ceremony. ‘I am very excited by this show of faith,’ he said. Peruvians have been divided over the statue, with many saying the figure of Christ will intrude on Lima’s skyline and that it too closely resembles the statue, Christ the Redeemer in Rio de Janeiro. The enormous structure was created in Brazil and transported to Peru in pieces, where it was assembled in the historic Morro Solar hill which overlooks Lima’s bay and 19 kilometres of beach on the Pacific coast. Many citizens, including Lima’s Mayor Susana Villaran have called into question the location of the statue and say its lighting system with 26 different colours will be an eyesore. 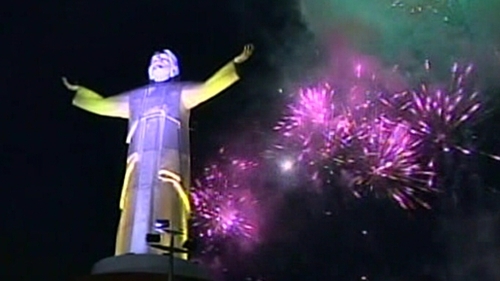 Peru’s newly erected statue of Christ is the tallest in the world. Second is the 120 foot (36 metre) Christ the King statue which was erected last year in Swiebodzin, Poland. Rio de Janeiro’s world-famous 99 foot (30 metre) Christ the Redeemer came in third.